7x5x1-1/4" White Embossed Swirl Jewelry Box with non-tarnish cotton fiber. Made in the USA. Jewelry boxes contain 100% recycled boxboard which is the largest component of the box by weight, does not include paper outer wrap. Paper outer wrap are 20% recycled. This rectangle shaped box is great for larger jewelry and small gifts. Nashville Wraps Jewelry boxes are made in the USA from recycled materials. 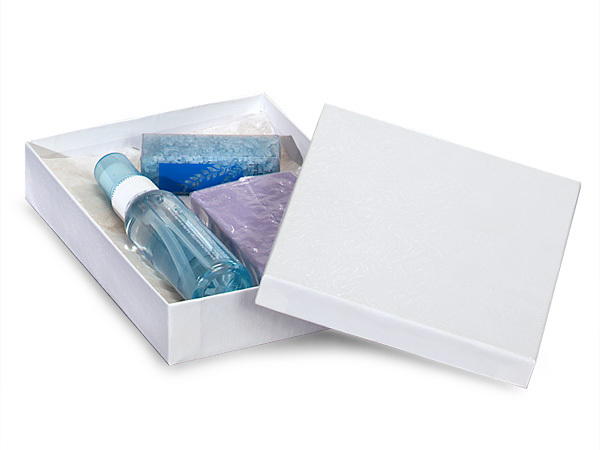 These are 2-piece rigid setup boxes filled with non-tarnishing ultra white synthetic cotton. There are many sizes available for small items such as earrings or large items such as silverware. A pre-packed 72 pc assortment is also available. Jewelry boxes contain 100% recycled boxboard which is the largest component of the box by weight, and the overall recycled content is approximately 80% including coverings.